The El Capitan Vaquero Stampede officially faced off the 2018 high school cross country season Aug. 25 at Lakeside’s Lindo Lake. Top East County female runners included Valhalla sophomore Peri Kraft (first in the Division II girls frosh/soph race with a time of 9:43), Christian sophomore Alaina Zamorano (first the Division III frosh/soph race in 9:38), El Capitan junior Carolinh Calvert (second in the Division II girls junior/senior race in 9:37) and Christian sophomore Leah Kunde (fourth in the Division III frosh/soph race in 10:14). Top East County male runners included El Capitan senior Matt Machnov (second in the Division II boys junior/senior race in 10:36), Granite Hills sophomore Manuel Garcia (fourth in the Division II boys frosh/soph race in 8:38) and Santana sophomore Jack McMackin (fifth in the Division III frosh/soph race in 8:51). All girls races were contested at 1.65 miles. Boys races were 2.15 miles for juniors and seniors and 1.65 miles for freshmen and sophomores. 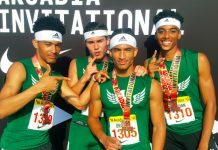 Fast-forward to last Friday’s 45th annual South Bay Invitational at Chula Vista’s Rohr Park and El Capitan runners once again were challenging at the front of the pack. Calvert, a two-time state meet qualifier, finished second among girls varsity runners with a time of 15:40 on the 2.5-mile course to set a school record. The Vaquero distance standout runner finished 16 seconds behind race winner Mariana Beltran-Picos, a senior from Olympian High School, and 18 seconds ahead of Point Loma senior Brooke Rodi, who finished in third place among the 173 runners in the race. Calvert is someone who is running with a lot of confidence at the moment. “I’m hoping to get to state again and win conference,” she said matter-of-factly. Calvert finished 37th in the Division III girls race at last year’s state championship meet after placing 53rd in the division as a freshman. She has helped set the pace in the races in which she has competed this season. Calvert finished first in her division at the Aug. 31 West Hills Wolf Pack Invitational; she placed sixth in her 135-deep division at the Mt. Carmel/Asics Invitational Sept. 15 at Morley Field. Grossmont sophomore Madeline Minutelli (fourth, 16:10) and West Hills senior Katy Willweber (seventh, 16:23) both joined Calvert with top 10 place-finishes at this year’s South Bay Invitational. Calvert bettered the school record for the course of 15:47 by seven seconds. Machnov is another contender to earn postseason accolades. He finished sixth in the 182-deep boys varsity field at last Friday’s South Bay Invitational with a time of 16:26 on the 5K course. San Pasqual senior Franky Varela captured the top time of 15:40, followed by San Diego junior Henry McClish in second place in 16:01. Grossmont senior Jonathan Rodriguez-Gomez finished in third place, also in 16:01, followed by Point Loma senior Hunter Sweet in fourth place in 16:11 and San Pasqual senior Mathis Woulters in fifth place in 16:15. Machnov crossed the finish line with a one-second lead on Point Loma senior Joshua Bauer, who finished seventh in the race. Machnov and his teammates appear to be on course to accomplish those goals. 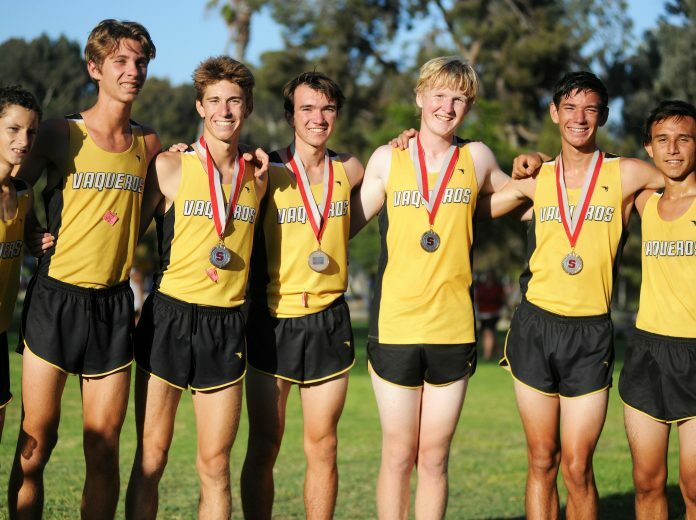 The Vaqueros, buoyed by three finishers among the top 20 individuals (four among the top 26), finished second among the 27 scoring teams in the division at this year’s South Bay Invitational. 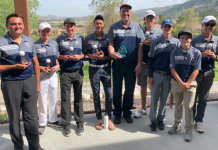 El Capitan’s five scorers totaled 101 points, placing the Lakeside team place just three points behind team champion San Pasqual (98 points). For the runner-up Vaqueros, junior Andrew Sager finished eighth overall in 16:32 while senior Joeseph Hart was 19th in 16:51. Additionally, sophomore Parker Dixon placed 26th in 17:10 while senior Leland Hayley finished 42 in 17:32. El Capitan finished 58 points ahead of fifth place Grossmont in the division standings and 108 points ahead of seventh place Granite Hills. West Hills finished ninth in the division with 249 points.